I imagine most people, like myself, see the term “oak-aged” and automatically assume the term is synonymous with “barrel-aged”. When I first started looking into using wood in my homebrewing, I spent a long time looking through the various sizes of barrels available and concluded there was no way I’d be able to sell this to my SO, and even if I could, I didn’t have the space in my tiny apartment. My local homebrew shop carried oak chips. When I was talking to the owner about my plans to make a wood-aged Imperial Stout, they pointed me towards the chips they carried. They were medium-toast chips, about 4 oz, packaged by the homebrew shop from what I imagine was a larger bag. I was told to boil all 4 oz for about 10 minutes, then add the chips to a secondary fermenter and rack the beer on top of them. Well, what did I know? So I did, secondary and all. What I got was an oak-bomb, all tannic wood character and some slightly oxidized imperial stout. I wasn’t thrilled, and kept thinking that there had to be a better way to wood age. After some research, I not only learned that I had used way too many oak chips for far too long a period of time, but that there were fantastic barrel alternatives out there for homebrewers who don’t have the space for a barrel, don’t want to dedicate a full batch to wood-aging, or don’t want to drop the money on a barrel you may only use a few times. Chips are thin, small, flaked pieces of wood. They have a large surface area-to-volume ratio (lots of wood in contact with the liquid), which, as I learned the hard way, means they impart their flavor very quickly. Because they are so thin, chips are toasted fairly evenly. Toasting takes place on both sides of the chip and heat penetrates the wood easily. As a result, the flavor imparted by wood chips is said to be rather one-dimensional, reflecting the singular toast of the wood. This is not necessarily a bad thing, and at times a subtle, one-dimensional flavor may be useful, especially if wood is not intended to be one of the heavily present flavors of the beer (for example, Old Ale or Flanders Red can have some wood character). Cubes, also often called beans or tablets, are segments of wood that have been cut into larger chunks. Because of their size and shape, cubes have less surface area-to-volume than chips or powder, and they take longer to impart their flavor to beer. Since they are more dense, the toast on the outside of the cube does not necessarily reflect the toast of the inside, since heat would take longer to penetrate the wood. This means that, when aging, the longer the cubes are in contact with the beer, the more complex the imparted flavor will be, since the different levels of toasting will impart different flavors. The obvious con is that this takes more time than powder, essence, or chips, and the pro being that, since flavors take longer to be imparted, they can be controlled more effectively by sampling over a longer period of time. Essence is essentially a commercial wood extract that can be added to your beer, often at bottling. Since it is an extract, it is made to impart the oak flavor into your beer incredibly quickly and no aging is necessary (the wood flavor will still mellow overtime). Like chips, the flavor imparted from essence is often perceived as one-dimensional, even more so. Essence is fast, relatively cheap, and effective for what it is.That said, some users have reported that the extract tastes “artificial”. Not sure what to take from that, but there it is. Honeycombs are a fairly recent development, one I am particularly excited about. I love honeycombs. They are similar to staves and spirals, in that they are long segments of wood. However, the segments have holes drilled into them. This means a larger surface area to beer ratio, which means flavor is imparted faster, but not so fast that you’ll lose track of the flavors. My favorite part about honeycombs is that they are typically available in a much wider variety of woods than other types of additions, which means less work for you. As far as I can tell, the honeycomb has been pioneered by Black Swan Cooperage. They have nine types of honeycombs available, along with guidelines for using them and details about the sort of characteristics that the wood can impart. Powder is a dust that is added to beer a day or so before bottling. The beer will permeate it quickly, and it will sink to the bottom. Because of the rapid permeation, the flavor is extracted incredibly quickly. As you can imagine, powder has the highest surface area-to-volume ratio of the natural additions (all the listed additions besides extract). Powder has the potential to be incredibly one-dimensional to complex, depending on the toast(s) of the wood(s) the powder is taken from. However, the complex flavor from powder is itself often reported to be rather stale when compared to the flavors of cubes, spirals, and barrels. Besides extract, it is the hardest addition to separate from beer. Spirals are long, circular segments of wood. Because they are one solid segment, their removal is often incredibly simple. Commercially they are often more expensive than chips or cubes. Spirals are often said to impart a smoother, better flavor than cubes, quite possibly a result of having less surface area-to-volume. Spirals are often associated with vintners more than homebrewers, however they are still a valuable addition. Staves are similar to spirals in their use since they are single addition; however how they are made is different. Staves are often smaller sections of wood cut from larger staves, the ones used in barrels. Typically, these staves are cut from the length of the stave, so the broad side of the stave will reflect the red layer and the outer layer. They are generally thicker than spirals, but some staves are relatively thin. Size is an important consideration, because it affects how much wood character you will get from the addition and how quickly. Really, it depends. There is no hard and fast rule to adding wood to your beer. You need to consider how much flavor you want, how long you want to age, what sort of addition you are using, and so on. Its variable. Below is my “rule of thumb” guide for the additions to a 5 gallon batch. If you’re not sure where to start, the table will help you out. What I’d like to emphasize here is to take notes, measure how much you add of a certain addition and for how long, and then reflect on the wood character in the beer. Do you need less? More? Different wood? Consistency is key, figure out what works for your process. Addition How much? How long? ratio. Two days is pushing it. How should I add them? There are a variety of ways to add these various additions to your beers. It comes down to your personal preferred method and the sort of character your are looking for. A straight addition involves adding the wood directly to your beer. Just add the desired amount to your fermenter (or whatever you plan to age in) and let it go. This is my favorite way of adding wood to beer. It is simple, quick, and leaves you with that romantic wood aging feeling. It is also effective, and makes sure that you get a bit closer to that authentic (aging in a barrel) method that some people may hope to get closer to. The obvious issue with this method is sanitation, since nothing inherent in the method sanitizes the wood. Two preferred methods here, depending on the sort of wood you’re using. If the wood is fresh, I recommend you boil the wood for ten minutes. This will not only sanitize, but it will also get rid of some of the tannic qualities that fresh wood can impart. After boiling, just add the wood to the fermenter and get rid of the liquid. The second option, with wood that you’ve used before (typically, this will be staves or spirals), you can put the wood in the oven at around 170F for ten to fifteen minutes. Technically, sterilization temperatures are around 200F, but even at 170F you’re affecting the toast of the wood a bit. For this method, simply put your wood and enough alcohol to cover it in a seal-able container and let it sit. Two weeks is a good rule of thumb, but the longer the better. When you are ready to bottle, gently pour/siphon the liquid into beer, tasting as you go. When you have the level of flavor you would like, stop adding and then gently stir your beer so the tincture is evenly distributed. Once that is done you can go ahead and bottle! What I like about this method is that it allows you to control the flavors of your beer relatively easy. When you have the character you’d like, just stop. Simple. You can use whatever liquor you’d like, most often I see people using vodka or everclear since they are relatively “flavorless”. You can also use bourbon, whisky, rum, or whatever else you’d like to have a presence in your beer. In my opinion, you should be using vodka no matter what characters you want in your beer. If you want a bourbon barrel stout and plan to use a tincture, add the vodka-wood tincture and the bourbon desperately. This will allow you to control the levels of each, independent of one another. Combining them doesn’t give you any benefit. 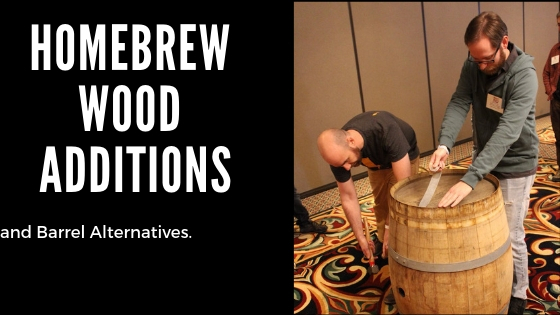 Same recommendation for those who plan to age their beer on wood and want bourbon character. No need to soak the cubes and then age on them, just age on the cubes and add the bourbon at bottling.